The Lucky 4 Ranch, designed by Uptic Studios, is the perfect log cabin for the South African landscape with its rich, wooden walls, beautiful surrounds and rustic look and feel. The interior design keeps it homely and a place where families want to spend long weekends and holidays or where friends want to wind down in the countryside. Ideal for South Africa's climate, this is a home that is cool in summer and warm in winter. Imagine afternoon walks, evenings playing games by the fireplace and mornings cooking breakfast as the sun comes out to play. 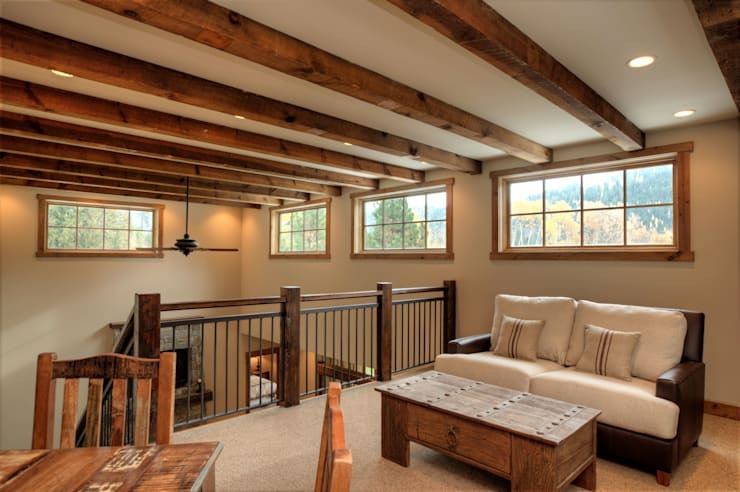 The architects have maintained a beautiful, simple and rustic design throughout the house, without compromising on the comfort and magnificence of the home itself. The overall effect is an incredibly warm and welcoming space—a ranch that no-one wants to leave. The sheer scale of the ranch house is impressive and grand, expanding over the flatter piece of the landscape, wedged between mountains and trees. Its gorgeous wooden walls and lighter wooden decks and window frames complement the environment around it, set against a backdrop of trees and forest. 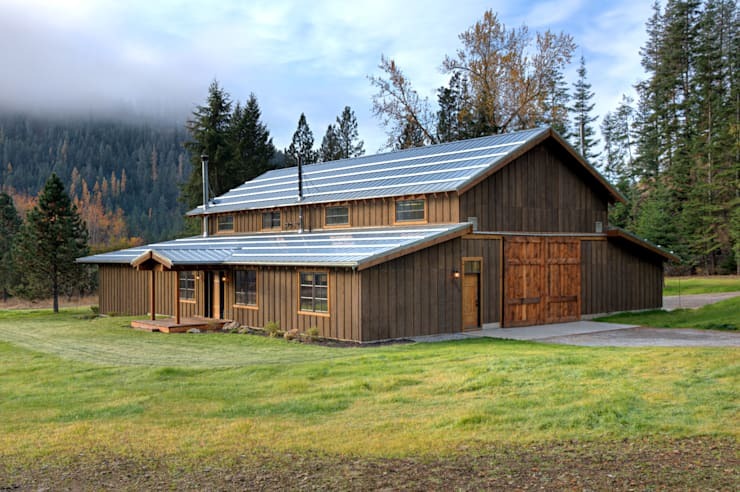 The ranch house has a rustic look and feel, despite its size and double-storey nature. Colours remain neutral throughout the exterior, where even the furniture maintains a honey-wood colour. Beautiful, big glass windows too reveal the warmth and homeliness that may lie within. The wooden colours of the home are offset by the beautiful and lush green grass surrounding the house, revealing the rolling fields that it sits on. This is a remote space, where horses roam and dogs run free. This is a home away from home where you can escape into the wilderness and into the peace and quiet. Approaching the ranch house from the back, it is clear to see that this home is a large one, with multiple windows both upstairs and downstairs. The darker, wooden walls are offset by large, lighter wooden double doors that are reminiscent of large, stable doors. 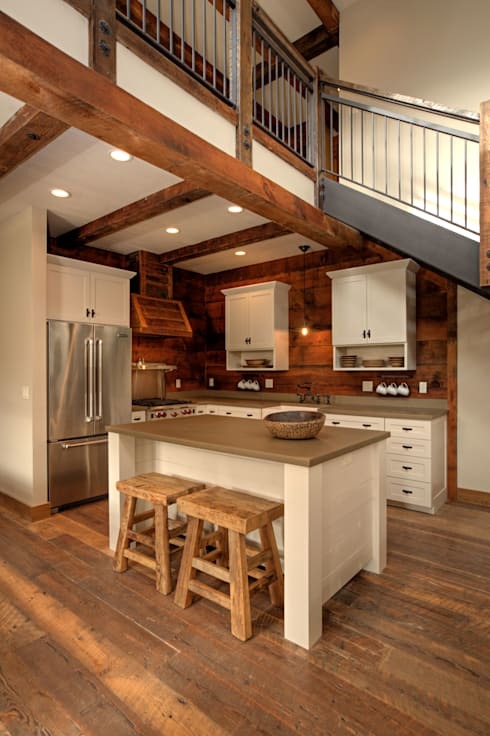 This design element has been incorporated to truly give the home a ranch look and feel, which it achieves successfully. Soft, strategically placed lights surround the exterior, giving it a warm glow. This not only works with the design of the house but it provides light throughout the exterior of the home. Due to it's location, the area will be pitch black at night time with no city lights or street lamps so the house needs to be well-lit. What is also striking from this angle is that there is no need for a high wall, electric fences or security cameras here. This is a home designed to feel free and safe. Entering the home, it is clear to see that the wooden theme transitions from the exterior to the interior. Warm, neutral colours are mirrored throughout. Beige walls offset the strong, dark wood, which is used for the flooring, the staircase and the finishes. The furniture also maintains this theme, which includes beige sofas, wooden tables and wooden chairs. While the interior designers have included a splash of colour to brighten the room, these colours are soft and warm, blending into the look and feel of this open plan home. Burnt orange, browns and touches of green are used for the cushions and rugs. A bit of colonial trend comes through in the form of a funky table, which resembles an old, mining cart or a horse-drawn cart. You can browse through other amazing living room products similar to this. Overall, the interior of the home is comfortable and cosy without any modern contraptions or bells and whistles. While the fridge, stove and oven are sleek and silver, the rest of the kitchen is modest and simple. 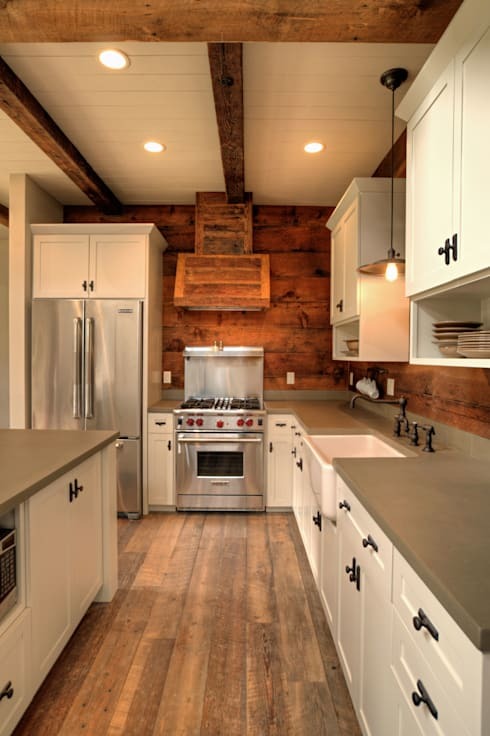 Plain white cupboards are offset by grey counter tops. There are no accessories or decor items featured here and all plates, glasses and wooden spoons are packed neatly away. The kitchen is also fairly compact and includes only the basics. The designers haven't gone for a large, modern kitchen, choosing instead to stick to the necessities. This is a kitchen designed to be used. From this angle the open plan nature of the kitchen can clearly be seen and it is evident that despite its simplicity, it's a space where families come together. A gorgeous breakfast bar/island separates the kitchen from the rest of the house making it a social space where the whole family can talk to each other while meals are being prepared. The kids can spend mornings eating their cereal at the breakfast bar while Mom and Dad brew the coffee. It's also a great spot for mixing the dough for cupcakes or muffins during afternoons spent baking. Two soft wooden chairs are positioned at the breakfast bar, adding to the wooden look and feel of the home. A simple fruit bowl is all that decorates the island. Lighting has been well-thought out in the kitchen, designed to open up the room. Nestled under the stairs in a nook, down lights as well as hanging lights have been utilised to brighten up every little corner and crack. On the landing of the stairs, it's clear to see that the neutral tones prevail. A soft, white sofa and wooden furniture are positioned in the room for comfort. The room is devoid of bright colours. Where the brightness does play a role, however, is in terms of the natural light. Big, gaping windows open up the house to the outside surrounds allowing pools of light to filter in. Because the home is open plan, the light flows throughout the house, complementing the warm wood. Ceiling fans helps to keep the house cool, but the wooden nature of the house ensures that it is naturally insulated. Living in a wooden house is also energy-efficient and more sustainable than a brick house. 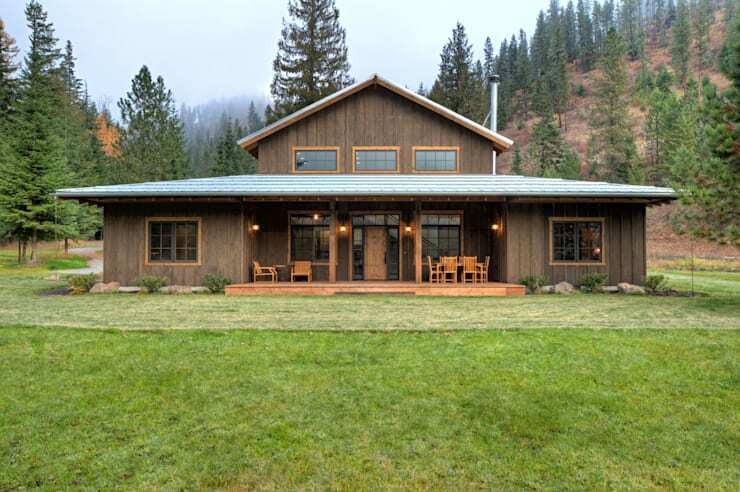 Comfort doesn't have to be ostentatious, it can be a simple, beautiful ranch house set in a sprawling forest. The Lucky 4 Ranch is a home to mirrored in the South African environment. Do you like wooden homes? You might also enjoy: A Cool Contemporary Wooden Home. 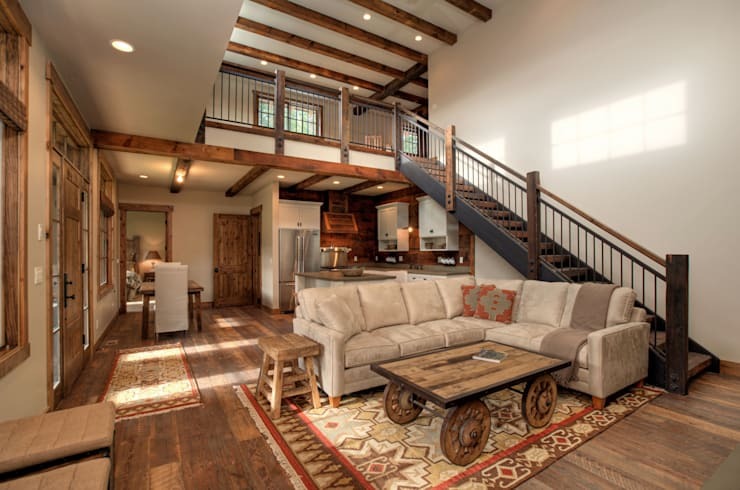 Did you like the rustic design of this home? Let us know!